The following note and letter were received from Presbyterian layman, Dan Delph. In giving me permission to share his words, it is his prayer that those who worked on Treasury of Daily Prayer are encouraged, and that as they move forward, “his Lutheran brothers and sisters” are encouraged as well. In early November of 2008, I was lead to search for a new approach to my daily devotional life. 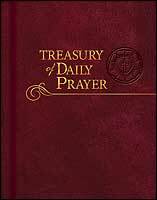 I discovered your Treasury of Daily Prayer just when it was newly published and available only from Concordia. Not even Amazon had it in stock at that time. I knew I had found something extraordinary; something of historical significance. You will understand what your work has meant to me and my family when you read the attached letter that I wrote today to my daughter and her fiancé who will be married in October. You should know that I have been a Presbyterian for most of my redeemed life, and never a member of the Lutheran tradition. I will be mailing the letter today, along with their personal copies of the Treasury. Your work has changed my devotional life, Scot, and given back to me the rich heritage of the historical church. Thank you for following God’s leading to bring this profound gift to the Body of Christ in our day. Mom and I are excited that you have begun your Premarital Program at __________. We want to supplement that instruction with something that will help you continue to grow individually—and consequently together—for the rest of your lives. The book you now hold is a work of extraordinary significance. It is a treasure trove of the ancient traditions of the Christian faith. In order to truly appreciate this book, a little background is in order. To my knowledge, I and my siblings are the first generation of regenerated believers in a very long line of Roman Catholics. Many centuries ago the Roman Catholic Church became corrupt and lost its way. The Protestant Reformation, led by the Augustinian monk Martin Luther, was a movement by God to restore the Roman Church. It is important to realize that Luther’s desire was to reform the Church of Rome, not abandon it. However, when the Roman leadership refused to repent, Luther endeavored to retain the historical and biblical truth, goodness, and beauty that had been entrusted to the church before its decline. 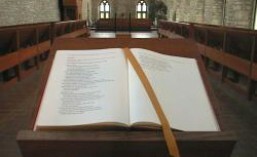 As such, we owe a huge debt of gratitude to the Lutheran denomination for faithfully preserving over the centuries the historical traditions of the early church—sacred liturgy, hymnody, written prayers, ancient music, the daily office, propers for daily prayer, sacramental preparations, biographies of early saints, writings of the church fathers, sung prayers (chant melodies), catechisms, psalter, invitatories, antiphons, responsories, and the ancient church calendar. So many in post-modern Christianity have thrown the baby out with the bath water. They consider the ancient traditions to be obsolete, lifeless, and guilty by association with some denominations in spiritual decline. However, it is only the hearts of men that grow lifeless, not the Word of God. Any man or woman filled with God’s Spirit and genuinely seeking him will find in these pages great depth and life. These are the forms of worship and spiritual disciplines of the early church. They are meat, not milk. As such, they may be an acquired taste to a generation raised on spiritual fast food. In a historical sense, we are all reformed Catholics. That may be hard for some to swallow, but the living Body of Christ today stands on the shoulders of the early church, whose practices were handed down from the teachings and instruction of the apostles and early church fathers. This volume represents the rich legacy of our early Roman Catholic heritage, preserved for us by our Lutheran brethren. What makes this particular work so extraordinary is how the editorial team, led by Scot Kinnaman, has harmonized the content. In the readings of any given day, they have skillfully correlated a psalm, an Old Testament passage, a New Testament passage, a verse of a hymn, a historical writing, and a written prayer. It is powerful, and a thing of beauty. It has become my daily devotional guide. One day, God may lead you to do the same. Wait until then. Don’t force it, and don’t force each other. Just keep it in a handy place. If that day comes, purpose to slowly and prayerfully make your way through, each at your own pace. Although the daily offices (readings) are aligned with the annual church calendar, don’t expect to read through it in one year. Rather, approach it like a fine wine, to be sipped, savored, and contemplated. Mediate your way through it, asking God to grow your spiritual tastes and appetites. I have included special pens that work well on the paper of this book. Make notes as you go. Mark and underline passages that speak to you. Place question marks where you need more understanding and revelation. Talk to God in the margins. Document your thoughts, desires, and prayers as you read and meditate. Make this something your children will one day page through and discover insights into your walk with God. God promises rich blessings as you engage his grace and encounter his steadfast love and mercies in these pages, new every morning. To the assisting editors, to countless contributors, to the production editors, the copy editors, the designer and the many others who had their hand in bringing this book from dream to reality: congratulations. My name cannot appear in association with Treasury without the complete understanding that it could not have been done alone. Together we are part of something bigger than ourselves, something that God has been pleased to use for the care and life of His Bride, the Church. Praise be to God. To Him alone be the glory. This entry was posted in Treasury of Daily Prayer and tagged Lutheran, Presbyterian, Treasury of Daily Prayer. Bookmark the permalink.